Since I started working from home more or less full time I have thought lunch time was one of the definitive downsides... no more office cafeteria with nice hot soups and delicious "wienerbrød" (spandauer/danish) and hot meal on Fridays, no more humorous talks with colleagues, coffee machine, waffles... Well, today was the exception. 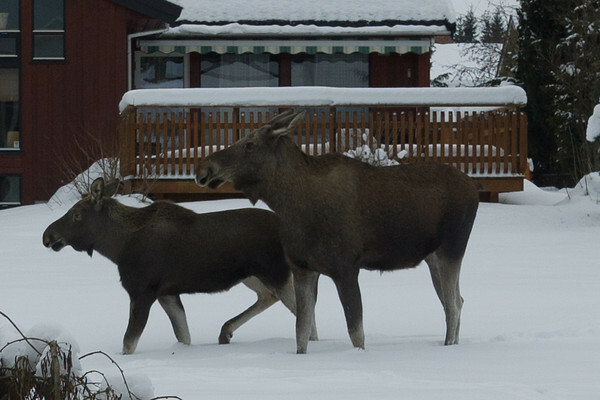 Even though I have seen moose in the wild up-close several times before, I have never seen them in this neighborhood, a relatively densely populated area (yet pretty close to fields and forests). Wow, that was cool. Maybe it's not that bad to eat lunch at home after all?